Progress registration on resources in production is provided in Scia Steel via the employee registration tool. The progress is entered in the program for positions, assemblies and stock pieces on the specified employee and resource. The amount produced with optional required real times can be entered on a level which can be decided freely for each activity. After registration, the records can be verified against errors and corrected before the final processing in Scia Steel. Optionally the registration can be done via barcode collectors in order to reduce the registration effort to a minimum. The progress registration on activities starts with opening the employee registration tool. To start with new registration entries, the selection of the registration level needs to be chosen together with the status filter which will be set to the option “filter on status 0”. The registration itself is done by adding new records and entering the data received from the production into the data fields. 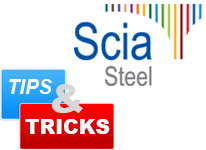 The use of choice lists linked to the Scia Steel database in combination with narrowing of the content for these choice lists, based on the already provided values, makes the data entry user friendly and minimises the risk of errors. When all data are added, the status of all records can be augmented to make an independent verification of the data with the goal to process the results correctly in Scia Steel. The results of the progress registration can be verified in the planning and progress dialog or in the new progress manager dialog in CIM Time. It is obvious that all kinds of reports can be made using the progress registration data. Theoretical time calculation for positions and assemblies for the resources has to be properly done.